To Dr. Thomas Wing, everything was potential, possibilities. Nothing thwarted him for long. Problems were puzzles to be solved. FDA shutdowns prompted him to explore new areas of discovery. Opportunities abounded. Everywhere he looked, he could see how to make the world a better, safer place. 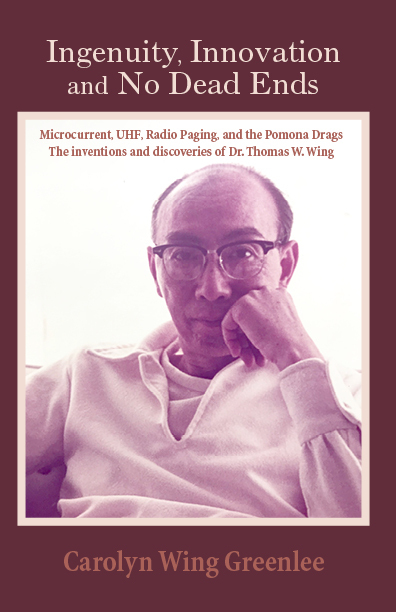 Through these accounts, Dr. Wing tells in his own voice what motivated him to prove the value of UHF waves for emergency communications, prove a mobile messaging system could be feasible, popularize drag racing at the Pomona Fairgrounds, and pioneer microcurrent, which would revolutionize electronic medicine. But to Carolyn Wing Greenlee, more important than what her father did is who he was. Into the narrative she weaves stories of ways he interacted with others, their accounts of how those associations expanded their lives, and insights from those closest to him. It’s a love story of family, friends, community, humanity, and what can come into being when the focus is on helping others by providing solutions from our own best gifts.